Here’s the method seafood professionals use for quickly removing the heads, skin-on fillets, and bones from pre-gutted whole fish. Grab hold of one of the fish’s fins by the head and pull up, using it to lift the flesh up to make cutting easier. Cut down into the fish with the blade angled towards the head. Stop when your blade hits the backbone. Flip the fish and make another similar cut down to the backbone. Cut through the backbone and remove the head & collar meat. Turn the fish so that the gutted belly is towards you. Place your knife at the head end, just above the backbone. Angle the blade of the knife slightly up (away from the backbone). Run the knife through the body of the fish from head end to the tail. You should be able to remove one whole fillet (belly fat & bones still attached). Set it aside. This cut’s a little trickier. Return your knife to the head end of the fish, this time just below the backbone. Angle the blade of the knife slightly up (towards the backbone), but not so much that you cut into the backbone. Run the knife through the body of the fish from head to tail. You should be able to remove the backbone & tail. Take one fillet at a time. Hold your knife at an angle fairly close to the curve of the fish’s belly meat, make a flat cut across the belly, just under the bones and fat to lift them off & remove them. Make one final cut straight down at the bottom of the fillet to remove the bottom skin & fat. Repeat with the other fillet. 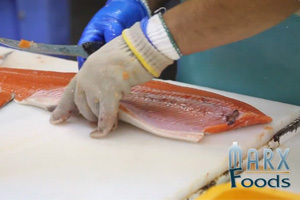 If you want to take the skin off of your fillets, see how to remove fish skin for tips. You’ll want to use a different technique for flatfish (like halibut).